What are Varicose Vein Socks / Compression Hose? Varicose veins socks are also commonly called compression hose, which is a specialized garment that may help the symptoms of varicose veins. It is a common treatment to use prior to having any vein procedures or surgeries, but is also used during the recovery of these procedures. The varicose vein socks can help to treat the symptoms of varicose veins and potentially prevent varicose veins from getting worse. Call 305-930-8941 or click here to book a varicose vein pain consultation. Why may you need varicose vein socks? With varicose veins, the veins become engorged with blood as the wall of the vein weakness or the one-way valves used to move blood back to the heart no longer function properly. This leads to fluid leaking out of the vein and into the surrounding tissue from an excess of pressure in the vein and causes swelling in the legs. Most of the symptoms that are caused by varicose veins are swelling, cramping, heaviness, and fatigue of the legs. This is where varicose vein socks come into use. How do varicose vein socks work? Compression hose or varicose vein socks are just that, a garment that is worn over the legs. It is not like any other sock or hose, as it provides a specific and constant amount of pressure to the legs. The pressure compresses the vein aiding the veins to moving blood back toward the heart. 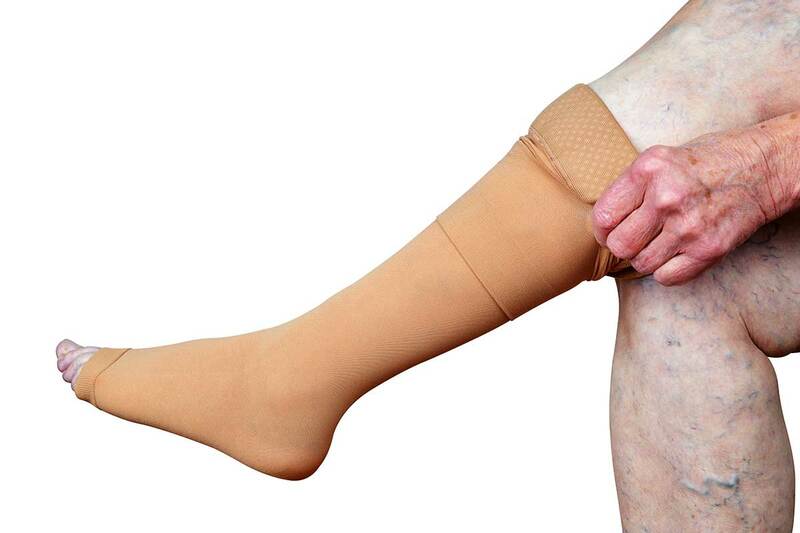 Varicose vein socks can help to reduce the swelling and heaviness from varicose veins. There are varying types of varicose vein socks. Some are short and stop just below the knee and some are long, going up to the mid thigh. As varicose vein socks provide a set amount of pressure, there are socks that provide different amount of pressure. The varicose veins socks that are found over the counter or through retail stores online provide a small amount of pressure. Prescription varicose vein socks provide the most compression and are specifically fit to the patient to avoid the socks being too tight. When Should you Wear Socks for Varicose Veins? Varicose vein socks should be put on first thing in the morning, before swelling has started or before swelling is at its worst. They are best worn during the day when at work, either sitting or standing for long periods of time and should be removed at night. Some physicians may advise patients to wear them at night, but for the most part, elevating the legs at night is appropriate. Although varicose vein socks can provide relief, there are a few negatives to their use. As they are extremely tight, it an be difficult to put these on and assistance may be needed with the use of another person or a special device. The socks can rub the skin and cause irritation, which is more common if they are not worn appropriately, they are not sized appropriately, or if there is any wrinkling of the sock. Socks should be removed every night, with checking the skin for irritation. Socks should be changed every 3-6 months. Are Compression Stockings the type of Vein Treatment you need? Compression alone is not likely to treat varicose veins, but it can improve symptoms and most certainly can prevent worsening of the varicose veins. Talk with your doctor about if varicose vein socks may be right for the treatment of your symptoms. Dr. Jose Almeida, a board certified surgeon, at the Miami Vein Center is a leading expert in the care of varicose veins. He has years of experience helping patients treat their varicose vein pain. If you are suffering due to varicose veins, please contact us today and ask how we can help.